'View in the fort of Monghir'. A large grassed area, with people walking about and with different conveyances, with in the distance the hill-top house of the Fort Commander. bl.uk > Online Gallery Home	> Online exhibitions	> Asia, Pacific and Africa Collections	> 'View in the fort of Monghir'. A large grassed area, with people walking about and with different conveyances, with in the distance the hill-top house of the Fort Commander. 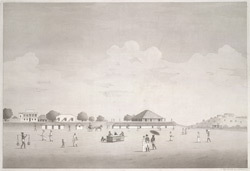 Aquatint of a view in the fort of Monghyr drawn and engraved by James Moffat (1775-1815) and published in Calcutta in 1806. Monghyr is situated on the south bank of the Ganges in Bihar. From the rule of Akbar in the late 16th century, Monghyr was controlled by the Mughal Emperors. However, Monghyr was also occupied by Mir Qasim, the Nawab of Bengal, during his conflict with the English in the second half of the 18th century. This view shows the interior of the fort. The house on the hill is thought to belong the Fort Commander.